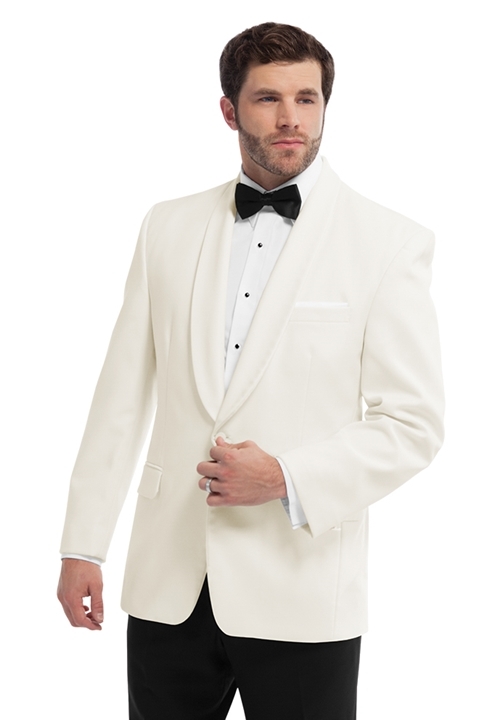 This Ivory Dinner Jacket features an elegant self fabric shawl lapel, a one button single-breasted front, self flap pockets, classic fit construction, and is fashioned from Tropical Weight White Polyester. Popular since it's conception in the early 1930's as "Tropical Black Tie Attire". This classy look truly has earned the title of "Timeless". This is an excellent choice for any Black Tie Event, Elegant Dinner, or Extravagant yet sophisticated Get-Together! Please note: Unlike the majority of our coats, The sleeves on this specific coat cannot be easily altered.